Jay graduated from the University of Queensland in 2007 with First Class Honours. He is very passionate about dentistry, takes great pride in all his work and will go the extra mile to look after you and your family. Jay will listen to you and talk with you and won’t lecture you. He is child-friendly and will help your kids learn to love going to the dentist for the routine hygiene visits necessary to maintain a healthy smile. In fact, some kids can’t wait to see “Dr Jay” again and ask their parents to make an appointment! Jay has a deep understanding of all possible treatment options from extractions to crowns and implants. He regularly attends continuing education courses to keep up with the very latest technology, techniques and materials available to help with your dental needs. Jay is also an Academic Clinical Supervisor at the University of Queensland’s Dental School, where he teaches and lectures dental students. 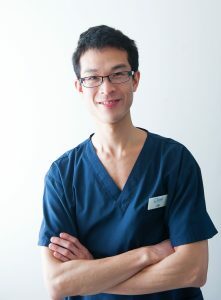 In addition to working, Jay participates in volunteer dental work, helping people who have fallen on hard times (with Homeless Connect Australia) as well as recently arrived refugees (with Tzu Chi Foundation). He has been involved with Tzu Chi Foundation since he was a student and is still actively involved now. Jay is a member of the Australian Dental Association, the Australian Prosthodontic Society, and the Cadmus Society of which he has been President. Outside of dentistry, Jay is a massive Brisbane Broncos fan, enjoys hiking, watching movies and playing tennis.